I tried Periscope a few weeks ago and I’m hooked. I love it and if you homeschool, I think you will, too. Here are six reasons you should try it. Periscope is a new social media platform that allows viewers to chat with live broadcasters. Currently, you can only give comments and hearts (via taps on the screen) via the mobile app. You can watch replays for 24 hours on your mobile device and on the web and even longer at katch.me. Follow me @Psychowith6 for saner homeschooling and living scopes. You can also follow me at WatchonPeriscope. Click the red Follow button on the right when the page opens. If you want to know more, check out my Periscope page. I couldn’t have homeschooled these past 16 years without my friends. But I am in awe that in just a few weeks, I have made great new homeschooling friends online. Watching live video of people is a much faster way of getting to know them than on any other social media platform. You can make new friends by watching other homeschool scopers, but getting in front of the camera yourself is even better! To make connections quickly, join our homeschool Periscope group on Facebook. Disclaimer: There are occasionally some rude people who will make inappropriate comments. If the broadcaster doesn’t share their location, that’s less likely. The scoper can just tap the comment and block that person. But for that reason, you may not want younger readers to watch scopes with you, even if you trust the broadcaster. One of the biggest problems in homeschool circles and especially with other forms of social media is the idea that everyone else has it more together than you do. All those perfect Pinterest photos and projects and even blog posts can make you feel inferior. What’s great is your homeschool heroes appear on Periscope sans makeup with kids screaming, misspeaking, and doing all kinds of very human things. What I also love is the confessions people make. They don’t speak like holier-than-thou experts, but like friends. That can take the pressure off of all of us imperfect homeschoolers. In that vein, you might enjoy 6 Reasons I’ll Never Be a Perfect Homeschooler. You can ask questions of your new real-life friends as they broadcast. If you want to know how to help your dyslexic student, homeschool Montessori style, or tailor an easy recipe, just ask! Scopers love to answer your questions. If your friends are always asking how you do something, why don’t you broadcast and share with all of us? Homeschoolers are all teachers and we would love to ask you those burning questions. Let’s face it. While I absolutely love Pinterest, it can be overwhelming. But the little doses of ideas you get through Periscope broadcasts are perfect. I’m doing challenging and fun workouts with RocaBody on Periscope, have found a new mascara to try, and have watched new recipes being made that I’m going to make asap. I have been way more active in putting ideas from Periscope into use, probably because I *see* how easy they are. Periscope is the perfect prescription for homeschool burnout or boredom. If you need that little extra motivation to organize your homeschool, join me on Thursdays! While there is currently no way to fast-forward or rewind videos in replay, I find that I can get tips and ideas very quickly from Periscope. Most broadcasts are short and good scopers get to the point quickly. You don’t have to stay for the whole broadcast and you walk away smarter. Contrast this to homeschool sessions at a conference. It’s rude to walk out of a talk, right? But viewers pop in and out of broadcasts on Periscope all the time. It’s not as freeing as listening to a podcast, but you can listen to broadcasts on your phone or computer while doing something else. I listen to them as I get ready in the mornings and even while I drive. I am not typically commenting when I’m busy doing something else (like driving), but I can tap and give some hearts and I feel like I’ve hung out with my friends. Download the free app (you’ll need a Twitter account if you don’t have one), search for Psychowith6 with the magnifying glass icon, and join us today and Monday through Saturday at 3:45 p.m. Central time for Homeschool Happy Hour with #homeschoolscopes. I’ll tell you about some great replays to catch (there is no topical search function on Periscope as of yet) and we’ll chat about what’s happening in our homeschools right now. Can’t make the live broadcast? No problem! You’ll see the replay in your list of broadcasts if you’re following me. I’ll also share the replays at Homeschool Sanity on Facebook. 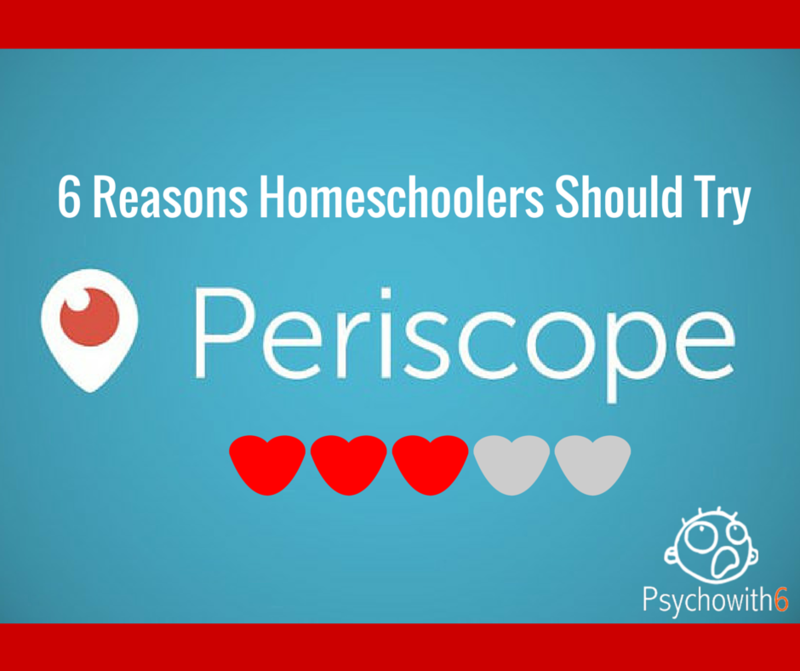 We’d love to have you join the Facebook Homeschool Periscope group, too. Have a homeschooling friend who would love this? Share it! Looking forward to connecting with you. I might do my first scope tomorrow! Be brave and do it! Do you know what time? Great post! I love it! So fun to connect with you on “Scope.” 🙂 Blessings to you and your family! Thanks, Kristi. It has been fun. It will be interesting to see what the future holds for Periscope and homeschoolers. I didn’t realize you wrote a post about Periscope in July. Great! Love it, Melanie!